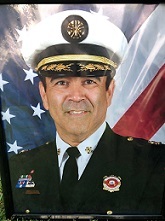 José A. Santiago served as the Fire Commissioner of the Chicago Fire Department. As Fire Commissioner, Santiago managed nearly 5,000 sworn members and an annual budget of over 560 million dollars. He made the Chicago Fire Department a leader in the fire service by implementing several best practices, including sweeping changes to the incident command policies with the use of innovative technology. These and other safety reforms established the Chicago Fire Department as an innovator in high-rise life safety. The club will initiate Brady, as the club Mascot, during the meeting. Retired Captain George Rabiela and ROTARY/One member, travels with Brady to assist first responders and those affected by tragedy.